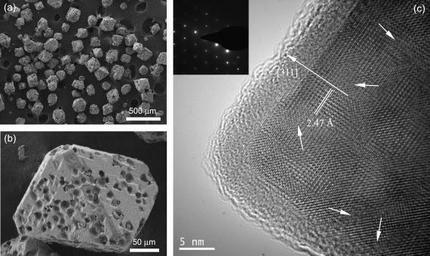 Electron micrographs of tiny superparamagnetic crystals of magnetite at different resolutions. The lowest resolution image (a) shows the octahedral crystals. At higher resolution, the 'craters' on the crystal surfaces are clearly visible. The highest resolution image (c) shows some of the defects in the crystal lattice, highlighted with the white arrows. Microscopic crystals could soon be zipping drugs around your body, taking them to diseased organs. In the past, this was thought to be impossible - the crystals, which have special magnetic properties, were so small that scientists could not control their movement. But now a team of Chinese researchers has found the solution, and their discovery has opened new applications that could use these crystals to improve - and perhaps even save - many lives. Kezheng Chen and Ji Ma from Quingdao University of Science and Technology, Quingdao, China have published a method of producing superparamagnetic crystals that are much larger than any that have been made before. If some magnetic materials, such as iron oxides, are small enough - perhaps a few millionths of a millimeter across, smaller than most viruses - they have an unusual property: their magnetization randomly flips as the temperature changes. By applying a magnetic field to these crystals, scientists can make them almost as strongly magnetic as ordinary fridge magnets. It might seem odd, but this is the strongest type of magnetism known. This phenomenon is called superparamagnetism. In theory, superparamagnetic particles could be ideal for drug delivery, as they can be directed to a tumor simply by using a magnetic field. Their tiny size, however, has made them difficult to guide precisely - until now. "The largest superparamagnetic materials that we have been able to make before now were clusters of nanocrystals that were together about a thousand times smaller than these," commented Dr. Chen. "These larger crystals are easier to control using external magnetic fields, and they will not aggregate when those fields are removed, which will make them much more useful in practical applications, including drug delivery." 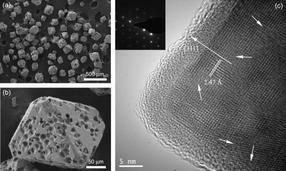 Chen and Ma explained that the high temperature and pressure under which the crystals form made tiny meteorite-like 'micro-particles' of magnetite escape from their surface. This caused the unusual pock-marked appearance of the crystal surfaces and induced a high degree of stress and strain into the lattice of the growing crystals. Crystals that grow under such high stresses and strains form with irregularities and defects in their crystal lattice, and it is these irregularities that are responsible for the unusual magnetic properties of Chen's crystals. Magnetite crystals of a similar size that are grown at a lower temperature and under normal pressure are only very weakly magnetic. This method of making larger superparamagnetic crystals paves the way for the development of superparamagnetic bulk materials that can be reliably controlled by moderate external magnetic forces, revolutionizing drug delivery to tumors and other sites in the body that need to be targeted precisely. And this is just the beginning. Chen's crystals might, for example, be useful in the many engineering projects that need "smart fluids" that change their properties when a magnetic field is applied. These can already be used to make vehicle suspension systems that automatically adjust as road conditions change, increasing comfort and safety, and to build more comfortable and realistic prosthetic limbs. Now that superparamagnetism is no longer restricted to minute particles that are difficult to handle, researchers can start exploring in which ways this can contribute to improving our lives.